Published: Dec 2017 i Previous editions(s) can be found in the Related Items tab. 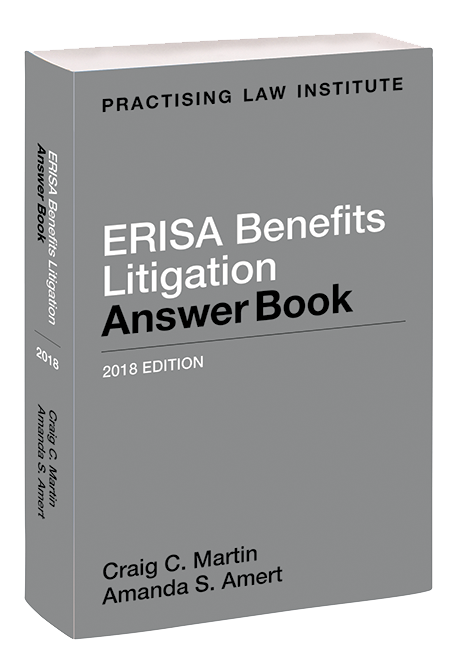 ERISA Benefits Litigation Answer Book provides a comprehensive overview, in question and answer format, of the various causes of action the Employee Retirement Income Security Act provides to remedy violations of the statute, enforce the terms of a benefit plan, or provide other relief to a plan, its participants or its fiduciaries. Written by a team of authors with many years of ERISA litigation experience, and filled with practical illustrations and tips, ERISA Benefits Litigation Answer Book describes the legal requirements of, defenses to, and unique aspects of litigation involving: stock drops, ESOPs, cash balance plans, prohibited transactions, 401(K) fees, recovery of benefits due under a plan, multi-employer plans, managed care plans, and discrimination and interference with benefits rights. Also covered are chapters discussing litigation of claims arising under federal common law, affirmative defenses to ERISA claims, and limitations on actions under ERISA.